All transactions are safe and secure with a reliable history in online purchasing behind each of our associates. 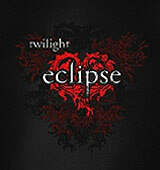 Buy the Twilight Eclipse of the Heart t-shirt to own Eclipse clothing and merchandise. This red heart Eclipse t-shirt reminds me of a certain 80s song. Can you guess what it is? Pair the love story of Bella and Edward, the name of the novel they got engaged in and this amazing tee design for the answer. If you still can't get it, put on your headphones and listen to Bonnie Tyler's "Total Eclipse of the Heart". Also, don't miss the Jacob Black tee or Edward Cullen tee below. In addition to the Twilight Eclipse of the Heart tee above, browse the Eclipse Clothing Gallery for more apparel like men's and women's clothes, kids shirts or hoodies.